Patagonia is a vast region that covers the southern sections of Chile and Argentina. Because the region is so big, a Patagonia map is an indespensible tool for any visitor planning a trip here. The Lakes District of Chile, Region X, lies at the northern end of Patagonia and the Punta Arenas and Magallanes Regions, Region XII, comprise the Southern end. Travelling through Patagonia is no simple matter as the road infrastructure is nowhere near as modern as those found in present day Europe or the United States and the airports are few and far between with limited flight schedules. 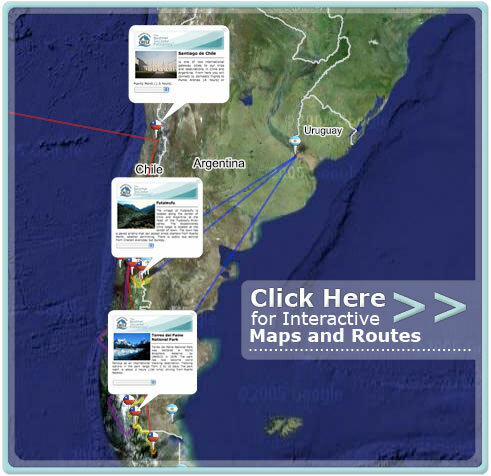 Use the interactive map of patagonia below to help plan your trip or vacation, orient yourself to our region of the world and familiarize yourself with the different travel routes available. Travel information for people going to Torres Del Paine National Park, Los Glaciares National Park and the Futaleufu River Valley, can be found here by clicking on the individual points of interest. Use the zoom function (+/- button) to blow-up the area in which you will be traveling. For those coming to Patagonia, Chile or Argentina nothing is more convenient than a fold-up travel map of Patagonia and the surrounding regions to know where you are headed. We assembled the following list of travel maps available for purchase. Available Maps: Patagonia, Chile and Argentina. The Chilean Tourism Agency (Turistel) has prepared maps of Patagonia for all people visiting the Patagonia region. Below you can find Turistel maps for Region X (The Lakes District), Region X (Chiloe District), Region XI (Aysen District) and Region XII (Magallanes District). where we run our Patagonia Safari and Ski Trips. The Futaleufu is in Region X (Chiloe District). These maps are somewhat dated, and a lot of road building has occured in Chile since they were originally published, but are the best we have seen on the web. Continue Secrets of Patagonia tour: Other places to visit in Patagonia.